Investors who own Apple as a core holding should consider adjusting positions based on technical charts and key trading levels. Apple (AAPL - Get Report) remains an investment of choice. The stock is cheap, with a price-to-earnings ratio of 10.5. Investors should beware however, that the stock's technical charts are negative. Shares of Apple may still decline, which will push its P/E even lower. The charts below show the key levels that must hold. Apple is a holding in Jim Cramer's Action Alerts PLUS Charitable Trust Portfolio. Cramer and Research Director Jack Mohr wrote on Friday that "the shareholder base has increasingly shifted from long-term fundamental investing toward short-term, event-driven trading (with the event being March- and June-quarter iPhone unit sales and associated gross margins). This has blinded the market to the company's long-term earnings potential -- a rash yet true reality that should weigh on the shares of Apple for the near future." Apple closed Wednesday at $94.19, down 10.5% year to date. It is in bear market territory, 30% below its all-time high of $134.54, set on April 28, 2015, a month after the stock became a component of the Dow Jones Industrial Average (INDU . Owning a core position in Apple because it's cheap is not a bad investment strategy, but investors need to learn how to use technical charts and key levels to trade around this "never sell" position. Let's that a look at monthly, weekly and daily charts for Apple to assess the risk and potential reward for the stock, both in the long term and near term. 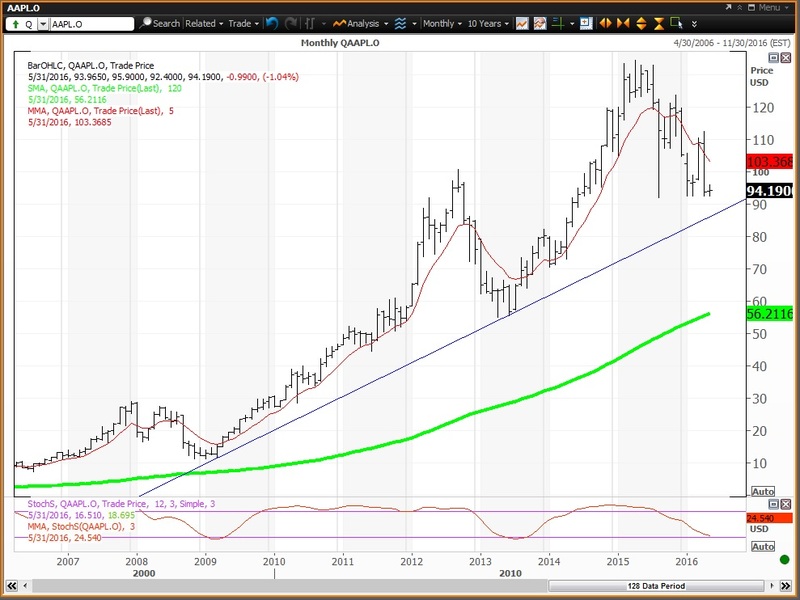 Here's the monthly chart for Apple. Apple has been a benchmark stock since bottoming in late 2008 into March 2009. The red line is the key monthly moving average, which ended April at $105.56. The up-trend off the low comes in at $86.14, which is the downside risk in May. 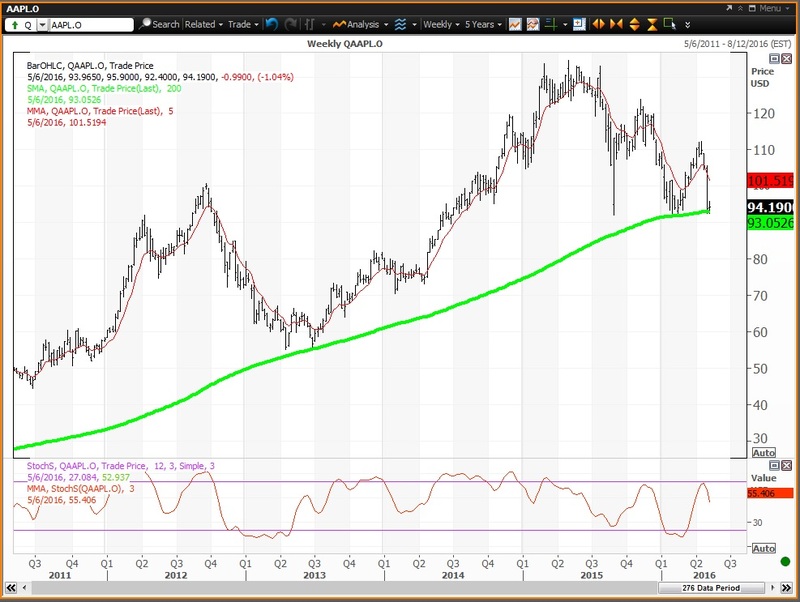 The green line is the 120-month simple moving average, which is the longer-term up-trend at $56.21. The study at the bottom of the chart in red is the monthly momentum, which has been sliding since August. Notice that the flash crash low of $92.00 set on Aug. 24 has held at monthly lows in January, February and April this year. Here's the weekly chart for Apple. The weekly chart is negative, with the stock below its key weekly moving average of $101.52. The 200-week simple moving average of $93.05 is a key chart support, as the stock has been above its 200-week since the week of April 10, 2009, when the average was $14.89. The weekly momentum reading is projected to decline to 55.41 this week, down from 60.57 on April 29. Here's the daily chart for Apple. The daily chart for Apple shows the Fibonacci Retracement levels of the decline from the all-time high of $134.54, set on April 28, 2015, and the 2015 low of $92.00, set on Aug. 24. Attempts to break to new lows in 2016 have held above the flash crash low of $92.00. The 2016 rebound stalled at $112.39 on April 14. This high was below the 50% retracement of $113.27. Going into the stock's earnings, released on April 26, the stock failed to hold its 38.2% retracement of $108.25 and its 23.6% retracement of $102.04. Investors looking to buy shares of Apple do not have a key level at which to buy, except the flash crash low of $92.00 set on Aug. 24. Key levels of $96.99, $104.75 and $110.22 will provide resistances. These levels are in play for May, June and the remainder of 2016, respectively. These are levels at which to consider as sell levels on strength. 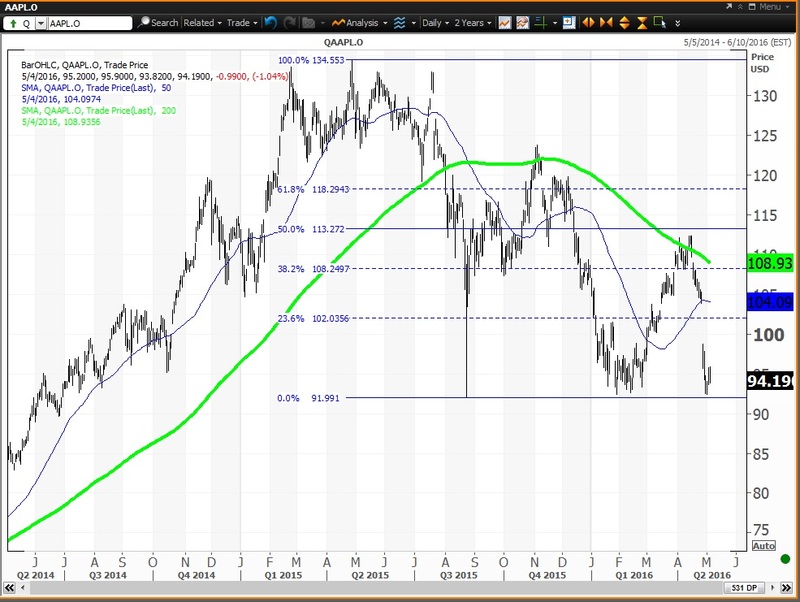 The bottom line is that a weekly close below $93.05 and $92.00 puts shares of Apple in uncharted waters.